To attract high number of participants, mayors, high city representatives and a European Commissioner. RESULT (R): over 600 delegates from 120 European cities took part in the conference, which is more than in previous years. Over 60 mayors and deputy mayors participated in the event, among them mayors of Vienna, Amsterdam, Rotterdam, and Tallinn. The European Commissioner for Mobility and Transport Violeta Bulc took on an active role in the event. Based on the experience from the previous years when there was less time for networking we wanted to change this aspect of our conference. 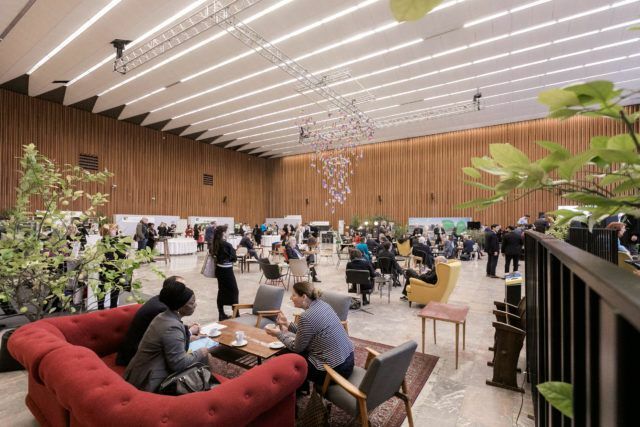 R: At the conference site, we transformed one of the halls in the sustainable CIRCULAR Café equipped with furniture from the Reuse Centre, innovative stands of conference partners and a wooden bar where participants were able to order coffee and other beverages without charge. R: During the time dedicated to socializing, we invited children from kindergartens to make pinwheels from sustainable materials at one of the stands assisted by a non-governmental organisation. To be highly hospitable and good organisers. R: the survey carried out after the conference has shown high satisfaction with the organisation. As organisers we offered all participants a free guided city tour, free-of-charge transportation and the food (also vegetarian and vegan kind of) and beverages during whole three days were complimentary. The conference logo (branding) was created using the prescribed colors of the EUROCITIES organisation. We added the green color as Ljubljana was the holder of the title European Green Capital 2016. We arranged colors in a circle representing circulation and thus connecting the theme of the conference with its image. At the event, all communication elements and the scenography used the pinwheel image linking the story of the conference all over the city and at different event sites. The best way to start the morning is with good coffee in pleasant company. This is how we started Thursday and Friday mornings at the EUROCITIES Conference 2017. Conference participants were invited to a specially set up café where waking up while listening to short presentations given by interesting and inspirational people. Circular Talks – we presented a brand new concept named Circular Talks. Iza Login, co-founder of the Login5 foundation, and Matej Čer, procurator, and founder of the Avantcar company, each had 20 minutes to present what they do and how their ideas convinced others. By using this concept, we have additionally opened the doors to ideas worth spreading and circulating beyond the borders of our country. At the conference, participants were deciding whom they wish to have coffee with. They could choose from six different people active in different areas to spend time with over coffee. Old or worn-out chairs were renovated with the help of three primary schools in October workshops organised by the cultural ecological society Smetumet. The fresh and refurbished chairs were also used in November as part of the scenery in the CIRCULAR Café as an example of circular economy. Delegates had the opportunity to leave their mark on a painting with a brush and paints to show how small strokes can create big changes. The painting done by a City of Ljubljana scholarship holder, who believes that art can contribute to key shifts in the world, and conference participants, carries the message that by joining forces we can bring about great changes. The conference preparations took more than one year. We formed a core conference-working group supervised by Deputy Mayor Tjaša Ficko and Mayor Zoran Janković. For the technical execution of the conference, we hired a professional conference organizer – PCO. the #EUROCITIES2017 reached over two million accounts on Twitter, and, in the week of the conference itself, over 200 different accounts were posting about #EUROCITIES2017 generating over 1.3k mentions and 900 engagements. • Wonderful organisation from Ljubljana team and EUROCITIES team. • Outstanding organisation from the host city. • Congratulations to all the Ljubljana staff! • You did a marvellous job! Best conference organisation ever! Really liked the networking, cafe corner and exhibition area which was well laid out and worked very well. • Very well organised with the shuttles, registration, and location. • I think the AGM/conference was good and a success. Keep on doing such good work! • Great idea – networking which brings together so many different people. I was surprised how many young people were part of events. Our circular economy month, a social media led the campaign in the lead up to the conference, highlighted examples of circular transition taking place in our cities through case studies, interviews, videos, and graphics. Over the course of the month, the #EUROCITIES2017 reached over two million accounts on Twitter, and, in the week of the conference itself, over 200 different accounts were posting about #EUROCITIES2017 generating over 1.3k mentions and 900 engagements. Timed with the conference, we also published 15 further examples of circular economy work, collected from members of our circular economy task force. The resulting publication ‘Full circle – cities and the circular economy’ is now available in the EUROCITIES office. As Abdeluheb Choho, Chair of the EUROCITIES Environment Forum and Deputy Mayor of Amsterdam, states in his foreword: “cities are the right scale and provide the perfect environment in which to test out new models”. The bags participants received at registration were made exclusively out of sustainable materials: in cooperation with the cultural ecological society Smetumet and people with disabilities, we have made a bag from a truck tarp and old tent windows with a see-through tag from transparencies collected by the employees of the City Administration of the City of Ljubljana. During the conference, participants drank tap water, that is, water out of jugs in which we put different fruits making inventive water creations. There were no plastic water bottles, and all plates and cups were biodegradable. In the café participants set on chairs and armchairs from the Reuse Centre, that is, on chairs made within the framework of the CHAIRity project. Participants were transported to different conference sites free-of-charge with environment-friendly buses (CNG) and electric vehicles Kavalir, Eurban, Tesla. • At the conference, the waste separation was arranged. After the conference, participants deposited the accreditation lanyards into a special suitcase so they can be used again for future conferences. Visionect wallpaper panels were installed, powered notice boards promoting the programme and displaying other information about the conference. All the food served was locally sourced reinforcing the promotion of short supply chains. At the award ceremony, Deputy Mayor wore a sustainable dress made out of apple leather (from apple peel) impressing the audience.